Apparently today is National Girl Scout Cookie Day. I’m not quite sure who got to decide that (perhaps the Girl Scouts? ), but it’s a pretty slick marketing ploy. Social media is all abuzz, parents are delivering cookies to coworkers, and you can even find Girls wearing cookie costumes, shilling for über-processed junk-food. Don’t get me wrong – I’m a fan of the Girl Scouts, and have tremendous respect for their organization. But I won’t buy their cookies. A couple of weeks ago, two very cute Girl Scouts rang our doorbell, wanting to sell us cookies. Matty and I gave them a donation instead of buying a box. My gripe about the cookies isn’t that they’re cookies – we can all enjoy a sweet treat every so often (though please don’t use the word “moderation”), and I’ve been known to enjoy my fair share of Thin Mints right out of the freezer. So why won’t I buy Girl Scout Cookies anymore? Put simply, they violate all three of my rules! They’re all made with refined flour. Most of them contain high fructose corn syrup. And almost all of the flavors contain partially hydrogenated oils. That means they have trans fats – even though their marketing prominently claims “Our cookies have zero grams trans fat per serving.” They can do this because of the trans fat loophole in the labeling laws. Artificially created trans fats have no legitimate place in our food supply; there’s no safe intake level of them, and it’s definitely possible for these cookies to be made without them. Other manufacturers do it, so why can’t the Girl Scouts? Most of the cookies also contain “natural” and artificial flavors. Both natural and artificial flavors have become a big pet peeve of mine, since they’re found in nearly every product these days. Taken individually, they may not be so bad. But as a whole, they’re impacting our ability to know and appreciate what real food actually tastes like. And now for 2013, their new Mango Cremes with NutriFusion cookies are “enhanced with nutrients.” They’re adding “natural whole food concentrate” of cranberry, pomegranate, orange, grape, strawberry, and shiitake mushrooms to the cookies – in a minuscule amount – and using that to market them as healthier. That’s nothing more than blatant healthwashing. (On the flip-side, at least that particular flavor doesn’t contain trans fats…). Starting around 2012, there was a huge uproar about the use of palm oil in the cookies. Yielding to pressure, they started phasing in sustainable palm oil in 2013, and at least one of the cookie manufacturers now claims to use 100% sustainable palm oil. 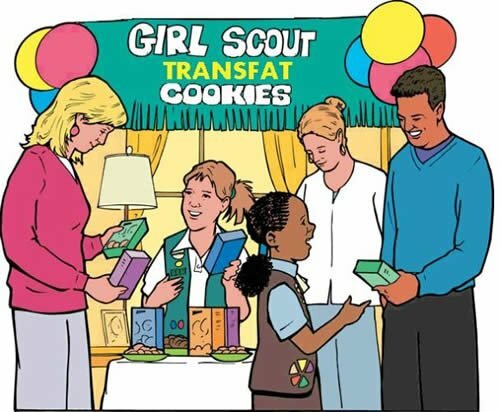 How about we apply some pressure to get them to remove all trans fats and fake flavors from their cookies, and to stop pretending their new cookies with added vitamins are any less unhealthy than the rest of their cookies? The Girl Scouts can – and must – do better for our kids and for everyone who buys those cookies. What do you think? (If you’re with me, but are still jonesing for Thin Mints, try my friend Adair’s awesome Chocolate-Covered Mint Leaves instead). “Girl Scout Cookies. Now, With Trans Fats!” © 2011 Mike Licht. 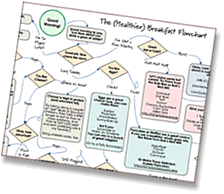 Used under Creative Commons License. Clean Eating? Let’s talk about Dirty Eating! Good for you for speaking up on this issue, Andrew. 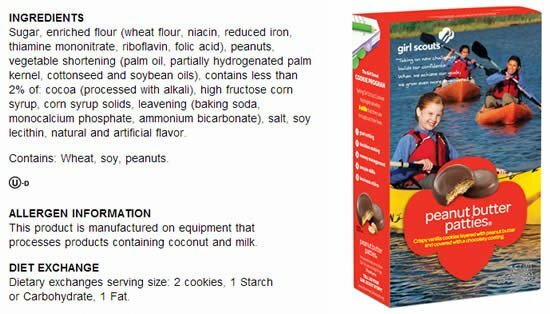 I loved being a Girl Scout, and I loved selling cookies as a kid (and wearing my sassy green sash), but the cookies really *are* packed with ingredients I’d never buy for my family. I generally make an exception when a GS comes to my door because of the nostalgia-factor, but you’re right: nothing will change unless enough folks speak up. And about that Boy Scout popcorn? The ingredients list on those tins is a horrorshow. I hadn’t actually looked at the Boy Scout Popcorn offerings until just now. Yuck! Back in my day (when we had to walk barefoot in the snow to school, uphill in both directions…), I think we only had plain, cheddar cheese, and caramel. Now it’s a smorgasbord of artificial flavoring and gunky ingredients. Sigh. Guess I’ll have to tackle that one next! Thanks Kristin; very well said! Dollars certainly speak louder than words, but it certainly helps to voice your dissatistfaction with the Girl Scouts! Well put and agree Kristin. More than the cookies the cooperate giant it all has become. Same reason we are no longer members of the NRA, or United Cerebral Palsy (my son is severely afflicted) is because the bucks being paid out to the board members is above greed and those in need such as with Cerebral Palsy are not seeing the funds. You should see the Girl Scouts Cooperate office in Portland Oregon. How much more could the money be used for the Girl Scouts to have adventures and learn then supporting some fat cats. /rant Plus the cookies are from a life time away or so it seems of when we enjoyed them. Can the donation be make so it stays in your troop?